This product gives you large portions of protein and carbohydrates, without the fat and sugar. 54 grams of complete protein. Contains glutamine-rich whey, milk protein concentrate and partially pre-digested whey peptides for improved protein synthesis. Each serving also contains added creatine and l-glutamine to help maximize muscle recovery growth. With no simple sugars, fructose or sucrose, it contains complex carbohydrates from maltodextrin to replenish muscle and liver glycogen after your workout so you can fully recover and grow. Provides a stable and enduring fuel, enhanced to drive growth nutrients into your thirsty muscles. Mix 2 scoops (75 g) into 8-10 fl oz water. Mix 4 scoops (150 g) into 16-20 fl oz water. The optimal time for a serving of CytoGainer is 30-45 minutes immediately after your workout. This timing is critical because your muscles absorb approximately 80% of the aminos and carbs necessary to help them grow during the two hour period immediately following exercise. 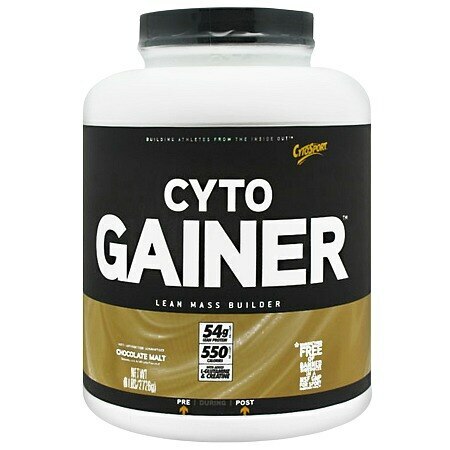 For additional carbs, protein and energy, take CytoGainer as a snack or meal replacement. CytoSports products complement a healthful eating and hydration plan that, when combined with a balanced exercise program may contribute to healthy weight management and recovery from exercise. Use 1-3 servings (75 g per serving) per day as part of a well-balanced diet that includes whole foods and other protein sources.. © 2012 CytoSport, Inc.
ALLERGEN STATEMENT: This product contains ingredients derived from milk and soy. This product is manufactured in a plant that processes milk, soy, wheat and eggs..